While I expected that the heritage sites would dazzle me, I was not expecting the anti-tanker signage found all over the villages of Masset, Old Masset, Skidegate, Queen Charlotte City and Tlell. 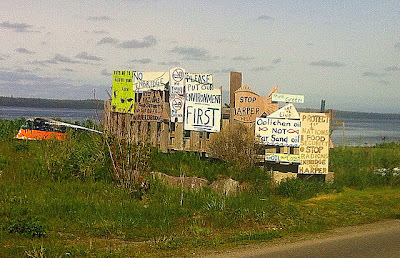 The signs were created by Islanders in protest of the proposed Northern Gateway Pipelines project, likely at the time that the pipeline review panel came through the villages. The pipeline, a project of Enbridge, is designed to bring bitumen from the oils sands in Alberta to the port of Kitimat in British Columbia. Once the bitumen reaches Kitimat, it will be shipped to refining stations in Asia by tanker. The routes to Asia require the tankers travel past Haida Gwaii. The signs illustrate the passion with which coastal British Columbians are resisting the Enbridge project and, in particular, tanker traffic. Some signs are straightforward messages of opposition to tankers. Some express fear of oil spills. Humour is common and so is militancy. Others are pleas to protect wildlife and, in some cases, the livelihoods of indigenous peoples who continue to use the resources provided by the ocean. And the signs themselves are fascinating: they are hand-drawn and each one is different. There is no apparent commercial operation producing these signs. They are scatted around the villages in obvious and obscure places. And, they are found in native and non-native contexts. I expect to use these pictures in my Anthropology classes in this Fall. They will fit nicely into lectures on globalization. They illustrate nicely that responses to global economic processes, like the trade in natural resources, are always local. Global activities are received, embraced or rejected according to local concerns and interests. And, in this case, the local voices are sounded with very personal messages on a fascinating collection of signs. Tad McIlraith is an instructor in Anthropology at Douglas College. 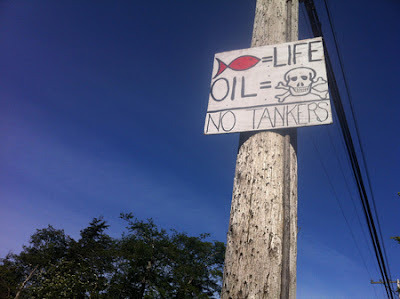 For the complete collection of anti-tanker signs from Haida Gwaii, see the album he created on Flickr.